This must change. Look at it this way. The tailored look lends variety in the modern casual scene. The jackets are flexible for all the vagaries of temperature from warm outside to over air-condtioned interiors. Or the reverse - adding comfort to a cool day out, yet removable for the warm interior. Skirts can be short or long, straight, pencil, flared or pleated. Jackets can be lined or unlined, menswear inspired or hourglass, or even boxy. 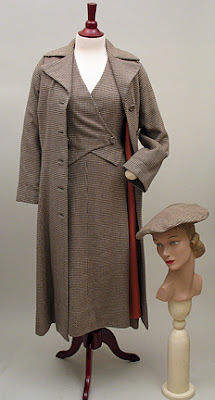 Why else do I love vintage suits -? The construction skills to make make a good suit are getting rare. Try to sew a bound buttonhole sometime - see how it goes. Or set in a sleeve perfectly. Or worse, set in a welt pocket with flaps. And the quality of vintage fabric - whether wool, rayon or silk, is harder to find. 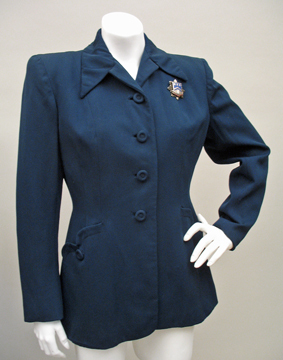 We added a group of vintage suits this month, and have more to come in October - including a stunning 1940s Lilli Ann. Oh!! That menswear tweed outfit made me squeal with joy! What an ensemble!